This review is for the sixth volume of Book Girl by Mizuki Nomura (with art by Miho Takeoka). The English edition was released by Yen Press in January 2013, and the entirety of the eight-volume series has made it over. I’ve reviewed the first five volumes of Book Girl over the years, and gave each of them a “Strongly Recommended” rating. These are books I can read again and again, and never grow tired of them. I love all the characters and the way each mystery is solved and how the stories tie in with classic literature. When I think of how much I love the Book Girl series, I’m mainly thinking of volumes 1 through 5. And I think I’ve decided 5 is my favorite, though 1 and 3 are just as special to me. My thoughts toward volumes 6 through 8 are much more conflicted. I still feel they are written wonderfully, but I have mixed feelings regarding how things actually play out for all the characters. It’s the sort of thing that’s a matter of personal preference, but I can only write my opinion for these reviews. 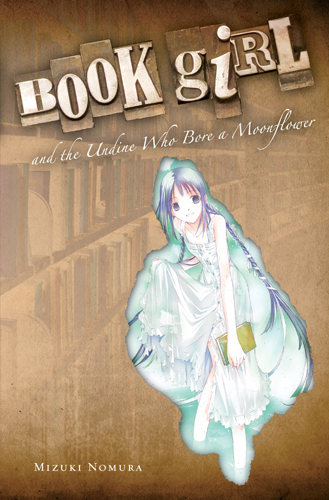 Today I will focus on volume 6, The Undine Who Bore a Moonflower. This story is actually a jump back in time chronologically, taking place during the summer break between volumes 2 and 3. What we get is essentially a bonus side story in which Konoha and Tohko work out a ghost-themed mystery at Maki Himekura’s summer home. As was the case in other volumes, the drama involves uncomfortable and bizarre events reminiscent of things that happened with past people who lived in the mansion, and it all ties forebodingly with a tragic work of classic literature–in this case, the play Demon Pond by Kyoka Izumi. 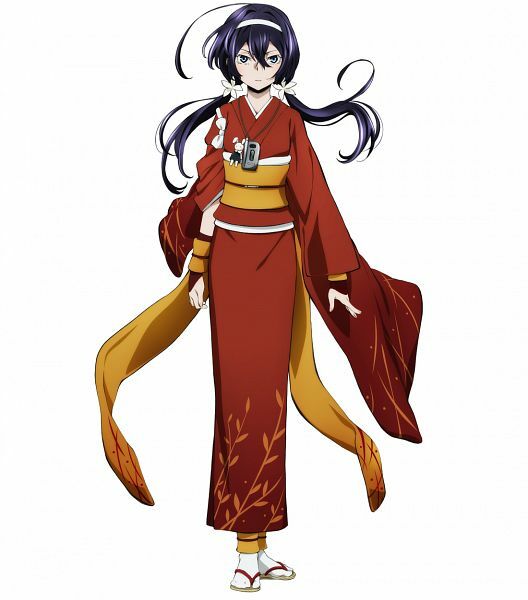 (Fans of the Bungo Stray Dogs manga and anime may recognize the name also belonging to a character with the magical ability “Demon Snow.”) Some of Kyoka Izumi’s works have been translated into English (including The Surgery Room, which gets referenced a few times by Tohko), but I can not find Demon Pond (Yasha ga Ike) specifically. I’d love to read it someday though–it sounds great. The Undine Who Bore a Moonflower is a lovely read, if only for its prose. Mizuki Nomura captures the emotions of each character so vividly, and I’m just delighted every time Tohko starts to liken some work of literature to a scrumptious meal and describe it with an uncanny level of detail. It is also nice to get more background for the scheming and free-spirited Maki, who is a bit of a fan favorite in this series. I’m personally with Konoha in finding her self-serving tenacity exasperating, but she still comes out of the story as a sympathetic character despite the extreme actions she takes. And really, it wouldn’t be a Book Girl novel without such theatrics anyways. Personally I felt the mystery was a bit too straightforward in this story, and too much of it devoted to people who had died decades ago. But my biggest issue with this volume–an issue that will continue into the last two entries of the series–has to do with the way the relationship between Konoha and Tohko is handled. Retcon sounds like too strong of a word, but basically it feels too obvious to me that the true intention of this side story is to get readers on board with accepting a new direction for the romance element of this series. But it’s not really a new direction because all of this actually happened way back, before volume 3… You see? I’ll probably get into this more in my final review of the series, which will cover both volumes 7 and 8 (as they are parts 1 and 2 of one big finale). At any rate, I still appreciated this volume for what it was, and recommend it to everyone who has enjoyed the series thus far. I love the prose in Book Girl and The Undine Who Bore a Moonflower! Personally, this volume is really special to me. I never get tired of reading it. Touko’s speech was really moving and I get beautiful images in my head whenever I read it. Do you recommend any Japanese Literature (that has been translated into English)? I read Night on the Galatic Railway and Other Stories and I really enjoyed it. Touko’s speeches are always very nice, and capture a lot of the feelings I imagine many readers get when they enjoy classic literature and good books in general. I have not read as many works of Japanese literature as I should, but I’ve appreciated some of the more well-known classics such as Kokoro by Natsume Soseki and No Longer Human by Osamu Dazai (which I read after learning about it in Book Girl and the Suicidal Mime). I really hope to one day find an English translation for Friendship (Yuujou) by Saneatsu Mushanokoji.